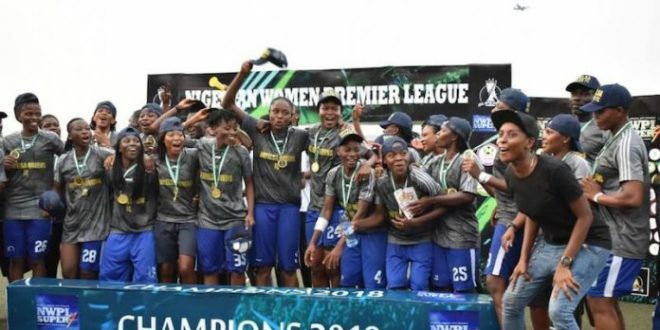 Bayelsa State Governor Henry Seriake Dickson has rewarded victorious Nigeria Women Premier League (NWPL) Champions Bayelsa Queens with N22million for clinching 2017/2018 Nigeria Women Premier League. The Restoration Girls spanked defending Champions Nasarawa Amazons 2-0 in a keenly contested final at the Agege Stadium in Lagos. While receiving the girls at the Government House in Yenagoa, Governor Dickson said plans are on to equip the Sports sector with world-class sports facilities that will see Bayelsa among the leading states in the country when it comes to sports facilities. Stressing that Bayelsa Queens triumph has shown that Bayelsa State is a state that does not associate itself with failure. He also directed the commissioner for transport in the state to immediately release one of the brand new coastal buses to the Restoration Girls. On his part, the stat’s Commissioner for Sports Development, Mr Perekiye Buruboyefe, said the success story of the triumphant Queens is incomplete without thanking the state government for their massive support. While appreciating the government he also explain how the (NWPL) is been run. In a message of appreciation, Bayelsa Queens Chairman, Mr Ebiki Timitimi, lauded the state government for the developmental stride put in place towards galvanizing sports in the state.